Some time ago, I attempted to research sources for kits on the Internet, only to find out that there wasn't a one-stop-website for Ham Radio kit suppliers. of the Four State QRP Group Kits many which has the coils etched right into the PC board! What a great idea! I've covered transmitters, transceivers, and some receivers here. Some accessories are mentioned in the source descriptions. Revised November 2018: It's been a long time since I've updated the page, and there have been too many changes to itemize them. There are several new listings worth checking out, including but not limited to QRPguys.com, HFSignals (BITX), Multus SDR, and Midway. My readers have suggested some more additions. As of today, 11/21/2018 I am adding TAPR, Heathkit, mcHF (M0NKA), Nightfire Electronics, and eBay. Added Mike's Electronic Parts 12/10/2018. Mike's is the source for simple radio construction parts (Fahnestock clips, Litz wire, MK484 chips, varicaps, etc) as well as some simple kits. -24hrsradioshop (eBay). http://stores.ebay.com/24hrsradioshop This eBay seller does not have any Ham-related transmitter, receiver, or transceiver kits, but sells a variety of AM and FM radio kits, as well as a Morse code oscillator for soldering practice, or just personal enjoyment. Nice selection of variable caps too for your homebrew projects. -ag6bd (eBay seller). http://www.ebay.com/usr/ag6bd This Thai eBay seller carries a variety of receivers, transceivers and accessories. As of this writing there are only a few items listed, but this varies up and down during the month. It would be impossible to list all of the items here, as many are not listed at the moment, and unfortunately there does seem to be a small language barrier. As I said, not everything is available all of the time, so check the completed listings for an idea of what might be coming, and check back often with ag6bd. • Cases for BitX40 and uBitX: These are professional metal cases for your HFSignals BitX radio projects to live in. Nice quality! -Amateur Radio Receivers. http://www.amateurradioreceivers.net/index.htm. David White, WN5Y offers his creations here. The ELR Kit is a really neat radio using 21 functional LEDs. -Assorted Chinese kits on AliExpress. https://bit.ly/2OYINVm There are several version of each category all based on simple designs that most Hams know. Crystal controlled kits come with crystals for 7023 kHz, but can be changed by the builder for any other 40 Meter crystal. Pixie requires one crystal, Frog needs two, and the Super RockMite needs three, all the same freq. -Borden Radio Company. http://www.xtalman.com/kits.html. In addition to a couple of accessory kits like a crystal radio tuner, and QRM rejector, Borden has some nice Crystal and Regen radio kits. • Dunwoody Crystal Radio Kit. The circuit is based on a very selective and sensitive design that has been used since the very early wireless days. It employs an antenna/ground tuning capacitor to fine tune the input to the parallel tank tuning circuit for optimum selectivity and signal level. The air variable capacitor tuned parallel tank circuit is then adjusted to resonate at the desired frequency. The combination of these two air variable capacitor tuned circuits makes this set perform far and away better than regular single-tuned, or slider-tuned crystal sets.Nickel plated brass fahnestock clips are used for all connections. All parts, screws, washers, sandpaper, and wire are included in this fine quality kit. • Armstrong One Tube Radio Kit. This little radio uses the best features of many famous one tube sets and has features not found on most radios of its type. One such feature is the capacitor coupling of the audio output . This feature prevents the "B" battery voltage from passing through the headset and possibly ruining the magnets. It also allows direct connection to amplifiers without further circuitry and also allows the use of ceramic earplugs when connected in series with a 10K ohm resistor. The capacitor coupling makes the detector more stable and reduces the "hand capacity" effect, thus making regeneration adjustment much easier. The special parts kits contain the American Made air variable tuning capacitor, in-circuit tested N.O.S. 3S4 vacuum tube, tube socket, fahnestock clips, solder lugs, resistors, capacitors, regeneration potentiometer with switch, coil form, mounting brackets, stand-offs, screws, magnet wire, hook-up wire, knobs, battery holder for "A" batteries, battery clips for "B" batteries, and the fine quality ready-to-finish routed basswood plaque for the base. Everything is included to build your own Armstrong One Tube Radio except the batteries, headset and antenna. • Pickard and FoxHole Crystal Radio Kits. These are the classic old fashioned crystal radio kits. The Pickard uses a standard diode detector, and the FoxHole uses a razor blade detector. -Breadboard Radio. http://breadboardradio.com Breadboard radio makes a few nice kits, all with a wooden breadboard –like base that the PC board attaches to when finished. In addition to the kits listed, there are a few “coming soon” items. A transmitter called the Wood Chip with variable RF output, VXO, T-R switch, sidetone, and more. Designed to be a good companion to the Sawdust receiver below. Also a new Tuner-dummy load-SWR meter combo, and 2 kits that have yet to be described planned for release later this year. The “Splinter II” QRPp Receiver / Transmitter. Direct conversion receiver that tunes about 100khz of the 40 meter band. Has bandpass filter with attenuator, 2 stage audio amp with RC filtering. Drives standard stereo headphones. Also receives SSB. The crystal controlled Transmitter puts out about 500-650 mW. Has SPOT function. New VXO pulls HC-49 pulls crystals 5 to 7 kHz!. Sidetone oscillator (now adjustable), and New switching transistor allows use of electronic keyers. Built in key, or jack for external. Complete kit: $49.95, with free shipping. The “Sawdust” Regen Receiver. Tunes about 75 kHz of the 40 meter band. CW, and SSB. Will drive headphones or small speaker. Fixed regen. Can also function as a code practice oscillator. Easy to build. Complete kit: $24.95 with free shipping. CS-series SSB Transceiver Kit with Speaker Microphone Combo. The CS-series supercedes the KN-Q7A. It inherits 6-pole crystal filter, MC1350 IF amplifier and rigid metal case. Also, it integrates Sandwich digital VFO to have wider frequency coverage and better frequency stability. A few more enhancements are also added. Speaker microphone is added to the standard configuration. CRK-10A CW Transceiver Kit. Available for 30 or 40 meters. Crystal controlled. 3 Watts output. Built in keyer. HT-1A 20/40m Dual Band CW Transceiver Kit. The HT-1A is a new dual band CW transceiver semi-kit with all SMD parts pre-mounted. As a little brother of the well known HB-1B, the HT-1A has solid performance, useful features and neat appearance. As a new line of CRKITS.COM, it is in a semi kit form with big modification capabilities and easy alignment. It is a real CW radio with 5 watts output, low noise single signal receiver, RIT and XIT, AGC and S-meter, built-in keyer, full break-in and even side tone selection from 500, 600 or 700 Hz. -Cumbria Designs. http://www.cumbriadesigns.co.uk/kits.htm . Several nice accessory kits offered here. A DSP filter, DSP-based CW reader, VFO stabilizer, and more. From the website: We offer a range of kits aimed at electronic hobbyists and educational establishments. Premium quality components from leading manufacturers together with comprehensive assembly and operating instructions ensure successful construction and trouble free operation. During the development of our kits, we have taken great care to 'design out' complexity so that no specialist skills or tools are required during assembly. Seasoned constructor or newcomer, you can be confident of success. In the unlikely event that that you can't get your finished kit to work, don't worry, we will provide support by email and telephone. If that's not enough, we offer a troubleshooting and repair service at a very competitive price. -Dan’s Small Parts and Kits. http://www.danssmallpartsandkits.net/ Mostly parts here of interest to the radio hobbyist but there are some kits about ⅔ of the way down the page. This seems like the place to get parts for some of these QRP kits above, like crystal-socket pins, and variable capacitors. Great assortment of stuff! In additon to the transmitters below there is an amp kit, an RIT, ans S Meter kit, and much more. Sienna Transceiver Kit. This is a high end, full-featured transceiver with many options. The Sienna can be a full-control stand-alone rig, or a computer-controlled-only rig. eBay (in general). https://ebay.to/2Kt1gss. This is just a search on eBay for "Ham Radio Kits". There are other search terms to use and you'll find many kits on eBay. Many are the Chinese kits discussed elsewhere in the guide here, and you'll also find some of the other sellers mentioned here selling direct on eBay like EA3GCY, Midway, and more. -Kits By EA3GCY https://www.qrphamradiokits.com/. This is the home of the ILER transceiver kits, as well as the ILER DDS-VFO. Shipped worldwide from Spain. All prices in Euros. ILER MK2 QRP SSB Monoband Transceiver Kit. Available for 20 or 40 Meters and now 17Meters too! Covers 60 – 100 Khz segment of the band chosen. Several coverage options available. 12-14 VDC. Output 4 – 5 Watts. Requires dynamic mic. VFO available as an additional kit, and a professional case available now. There are also package deals with the main kit, VFO, and case available. EGV-40 CW QRP 40M Transceiver. 40M CW Band. Stable VXO and very low current, 25mA RX (no signal), 3,5W out. PCB 100x85mm / 140 grams, heatsink included (no box). VXO tuning 40 kHz CW segment in 40M band. MFT-40 / MFT-20 DSB QRP Transceiver Kits. The MFT-40 / MFT-20 “My First Transceiver” is a simple, low-cost DSB double side band transceiver Kits similar to the famous “Beach-40”, “Micro-40” by VK3YE, “Wee Willy” by VA3IUL, etc. However, the MFT has improved both the receive and transmit characteristics, and its kit assembly puts the project within the reach of radio circuit builders of any level. -Elecraft. http://www.elecraft.com/ In addition to the classic K2 kit, which is, in my opinion the closest thing to building a Heathkit transceiver these days, there are modular kit versions of the K3S, and KX3, where the user just needs to connect all the boards and complete mechanical assembly. Elecraft also has a nice assortment of accessory kits. K3S Modular Kit. The K3S is Elecraft’s top of the line. Available in 10 and 100 watt versions and with a multitude of options. The modular kit comes with mostly pre-assembled boards that need to be plugged in. KX3 Modular Kit. The KX3 is Elecraft’s newest transceiver. Similar to the K3 in features, but in a compact portable package. This is a modular kit like the K3 that requires you to assemble the pre-soldered boards. Many options available. K2 Kit. The K2 is available only as a full kit. This is not a modular kit like the two above, but a full kit for the advanced kit builder. The K2 is a full-featured transceiver available in 10 and 100 watt versions, and with many options. -Electronics USA. http://electronicsusa.com/productsham.html A nice collection of kits including keys, keyers, and clocks. -Emtech. http://emtech.steadynet.com Emtech home of the excellent ZM-2 QRP tuner kit, raved about by QRP enthusiasts for years. -Etherkit. http://www.etherkit.com/ Etherkit is run by Jason Milldrum, NT7S, who prides himself in keeping his products completely open-source. Jason currently has parts and accessories for the Ham Radio experimenter, but keep an eye on his page for more projects in the future. -Four State QRP Group. http://www.4sqrp.com/kitIndex.php The folks at 4SQRP always have an interesting line of kits. Keep an eye on the webpage for new releases coming soon, as they seem to frequently release new and interesting kits. 4SQRP also has a line of accessory kits including tuners, filters, and keyers. While you're at it, if you are into QRP, join this wonderful group! NM0S Ozark Patrol Regenerative Receiver Kit. a two-band shortwave regenerative receiver, using only three NPN transistors in its circuit. It features a pre-drilled and silkscreened circuit board front panel, with a total of 38 through-hole components mounted on pads etched on the back of the panel. This style of PC board is known as a Pittsburg style board. 3.5 to 15 MHz in two bands. K1SWL Hilltopper 40. Dave Benson K1SWL, founder of the renown Small Wonder Labs, listened to you and has designed a 40 meter version of his winning Hilltopper 20 design. Four State QRP Group is honored to have been selected to kit the new transceiver. The Hilltopper 40 is a high performance CW transceiver for the 40M meter band. It is the perfect solution to your portable operation needs - small, lightweight, wide 40 meter frequency coverage and low current drain, extending the life of your portable power source. The receiver is adapted from K1SWL’s SW+ Series with minor modifications. A custom silk-screened PCB enclosure is included with the kit. No drilling or cutting required! NMØS Murania MW radio kit. The Four-State QRP Group has brought back the thrill of the early days of transistor radio building with the Murania receiver! Designed by David Cripe NM0S, this simple kit is the perfect starter project to get young people interested in our hobby or to bring back those warm memories gained listening to your first portable radio. NMØS Cricket 30. The Cricket 30, designed by David Cripe NMØS, is a low cost entry level ,and fun, minimalist CW transceiver for the 30 meter band. It is a real transceiver with TX/RX offset, full QSK, and a sidetone. It features a high quality PC Board, low parts count, excellent components for this design (MOSFETs), and a modern audio amp. Dave's famous etched spiral coils are included on the pc board, so there are NO TOROIDS to wind. Additionally a straight key is included on the board, just snap it off, mount it, and the whole rig is then self contained. Also included is an electronic keyer adapter. These are many many features for such a low parts count and inexpensive transceiver. K1SWL Hilltopper 20. The Hilltopper is a high performance CW transceiver for the 20M meter band. It is the perfect solution to your portable operation needs - small, lightweight, wide 20 meter frequency coverage and low current drain, extending the life of your portable power source. The receiver is adapted from K1SWL’s SW+ Series with minor modifications. A custom silk-screened PCB enclosure is included with the kit. No drilling or cutting required! Designed by Dave Benson K1SWL, founder of the renown Small Wonder Labs. ZZRX-40 Receiver. This simple receiver demonstrates how very few components can be assembled to make a functioning and usable HF receiver. Many receivers of similar design have been built from scratch and and kits. But the ZZRX-40 has a few wrinkles that the others may not. Incorporated into the design is the ability to easily choose an on board VXO or LC VFO - or an external VFO of your choice. The kit also includes AAØZZ's excellent silk screened and drilled enclosure design. -Fox Delta. http://products.foxdelta.com/ A great collection of ham radio kits. Includes computer interfaces, APRS kits, and more. G11 5 band SDR Transceiver Kit. Power output 10 W. SMT components factory pre-assembled, buyer to assemble only large through hole components. G59 All Mode 160-6M SDR transceiver kit. The G59 is an all-mode 160-6m SDR transceiver with 10mW of output power. The output is boosted to 10W with the GPA10 linear amplifier. -GQRP Club http://www.gqrp.com/sudden.htm. This QRP club from the UK, offers some of its designs in kit form. They have Limerick-style construction transmitters and receivers, as well as a matching tuner. Prices are lower for members, and anyone can join. Prices are in British Pounds. GQRP Club "Limerick Sudden" Transmitter Kit. Designed to match the Limerick Sudden receiver kit. The circuitry is a VXO, followed by a buffer and the PA is a 2N3866. The output is around 2 watts,the VXO & buffer are keyed by another transistor and there is muting on the RX antenna feed. There are 4 toroids to wind – a coupling transformer, and the 3 inductors of the 7 element low pass filter. The kit uses the “Limerick” method of construction, as used in the earlier receiver. The pads are actually etched on the board (like surface mount), and the interconnections between them are PCB tracks, hidden under the solder masking. No "through hole" connections are made, although "through hole" components are used. Available in 40 Meter version, more to follow. The kit includes all components, the complete case, and knob. GQRP Club "Limerick Sudden" Receiver Kit. Built around two integrated circuit chips; the SA602 and the LM386. Both lend themselves to simple receiver construction. Uses same method of construction as above, and is available in 160m, 80m, 40m, 30m, or 20m versions. Includes all components, complete case, and 9V battery. -Ham Gadgets. http://www.hamgadgets.com/. Several nice accessory kits here including keyer kits, voice recorder kit, and the famous ID-O-MATIC. -Hamtronics. http://www.hamtronics.com/menu_products.htm Hamtronics offers a variety of VHF and UHF receiver and exciter kits as well as many other interesting items. -Hans Summers http://www.hanssummers.com/ https://www.qrp-labs.com/ Hans sells the very popular Ultimate3S QRSS/WSPR kit, the insanely popular QCX CW transceiver, and coming soon, the QSX SSB transceiver kit. Check out his accessories and add-ons for his kits as well. Ultimate3S QRSS/WSPR kit. This kit is the new edition of the third version in the "Ultimate" QRSS/WSPR kit trilogy. It can produce QRSS, Hell, WSPR, Opera and PI4 slow-signal modes anywhere from 2200m to 2m bands. Plug-in LPF filters are available for all 13 HF/MF/LF bands from 2200m to 6m. $29.00 + S&H + many add ons and accessories. COMING SOON - QSX SSB Transceiver Kit. The QSX (QRP Labs SSB Xcvr) is a 40m SSB transceiver. It will have an optional 10-band (160m-10m) filter module, and an optional extruded aluminium enclosure. This will make an all-band HF all-mode 10W High performance transceiver. The kit inherits all the functionality of the famous QCX single-band CW transceiver kit but adds SSB, AM, FM, PSK31 and RTTY. This will be the lowest cost all-HF radio available but also high performance and packed with features. -Heathkit. http://heathkit.com. Heathkit it back. On a very small scale, but they are promising to get back into Amateur Radio as they grow. Currently offering one radio kit, and some other radio related products, and a modern redux of their old most-accurate clock kit. Explorer™ AM: TRF AM radio receiver (solder kit). This is the solder version of the introductory ExplorerTM AM radio. (We also offer a no-solder Heathkit JrTM version, the GR-150.) The GR-152 provides a gentle introduction to surface-mount soldering--just a couple easily-seen components soldered with your low-wattage soldering iron, and all others are classic through-hole discrete parts. -HF Signals. http://hfsignals.com. There have always been a few different kits on this list that were based on Ashhar Farhan's Bitx design, but Ashhar himself has been offering two different versions now though his HFSignals project in India. Although not technically kits in the true sense of the word, these radios still require assembly, and expertise. Online help and knowledge is extensive through groups.io, and several website all linked from hfsignals. µBITX. The µBITX is a general coverage HF SSB/CW transceiver kit with features you NEED for operating ease, convenience and versatility. It works from 3 MHz to 30 MHz, with up to 10 watts on SSB and CW with a very sensitive receiver. It features digital tuning, dual VFOs, RIT, CW Keyer and more. The µBITX is a general coverage HF SSB/CW transceiver kit with features you demand for operating ease, convenience and versatility. It features digital tuning, dual VFOs, RIT, CW Keyer and more. BITX40. The BITX40 is a monoband version of the kit above for 40 meters and heavily customizable. -Hobby PCB. http://www.hobbypcb.com/amateur-radio Hobby PCB sells an amplifier kit called the HardRock 50. This is an evolving project, but produces a very nice 50 Watt amp. They also have a 5 Watt drive board to use the HardRock with low power (.5Watt) radios, and they carry the boards for the WA2EUJ DSP-610 project. In addition to kits, HPCB has a couple of SDR based boards for HF and VHF/UHF. Not kits, but pre-assembled boards to be the centerpiece of a larger radio project. -Jackson Harbor Press http://wb9kzy.com/ham.htm JHP doesn't sell any radios at this time, but has a nice assortment of accessory kits available. JUMA TX136. JUMA TX136 is a digitally controlled CW transmitter kit for 136kHz (2200 meter) amateur radio band. JUMA TX500. JUMA TX500 is a digitally controlled CW transmitter kit for 500kHz (600 meter) amateur radio band. -KC9ON - Third Planet Solar https://kc9on.com/shop/ KC9ON sells a few nice accessories for the Heathkit HW8 QRP rig for fixing and enhancing the old favorite, as well as some other useful kits. He has also added a line of Chinese sourced kits including a version of the Pixie which includes his very useful Pixie Switch for adding multiple crystals to the Pixie. KC9ON is also a USA source of the Kanga UK line of kits listed elsewhere in this guide. - K5BCQ Kits http://www.qsl.net/k5bcq/Kits/Kits.html These Hams from the Austin QRP Club offer a page of accessories and support kits. There are LPF filters and amps, an Si570 Controller with display, a programmable keyer, and much more. Very reasonable too! -Kanga Products UK http://www.kanga-products.co.uk/. KangaProducts, UK is a separate company from Kanga US, although they have some similar products. Kanga UK has several interesting kits, as well as accessories. Ships worldwide. Kanga is also the UK distributor for 3rd Planet Solar, LNR Precision, K1EL, and QRPme Rockmite kits. Finningley 80M SDR Reciever. This kit was produced for the Microwave Roundtable earlier this year. Kanga Products have kindly been given permission to re-produce the kit. This simple SMD kit is a great way to get into Software Defined Radio. Acorn II SDR receiver. The Acorn II offers a 40m receiver kit, with two options of frequency control - Crystals or External Frequency Control using the "m0xpd Si5351A Arduino Shield"
Foxx-3 Transceiver. The FOXX-3 is the latest version of the ever-popular FOXX. Designed by Derek Alexander, it incorporates a sidetone oscillator, changeover relay and low-pass filter. It fits inside an Altoids (TM)mint tin and all connections are made via vertical connectors which are concealed when the lid is closed. The connections are as follows: antenna via50 ohm BNC, power via 2 pin 0.1" header, headphones via 3.5mm mono or stereo jack plug or 2 pin header, Morse key via 3.5mm mono or stereo jack plug or 2pin header. We also supply a small PCB-mounted switch which can be used as the key for ultimate portability. All you need to add are a 12 volt DC supply,headphones and an antenna and tuner. Available for 20, 30, 40, or 80 Meters. DX 40m DC Receiver. The DX 40m DC Receiver is a collaboration between Steve Elliott K1EL of Winkeyer Fame (See Hamcrafters Page) and Kanga Products (UK). Conventional VFO – Tuning 7.000 MHz – 7.200 MHz, 20x4 LCD Screen, CW reader, Frequency Readout, 9 volt or 12 volt operation, Switched-bandwidth audio filter and mute. URMSTON Regen Receiver. The "URMSTON" Regen Receiver is a join venture between the G-QRP Club and Kanga (UK). The Circuit design created by George Dobbs G3RJV and Paul m0xpd who also created the PCB have produced what is a great Receiver. The Kit was used as the G-QRP Buildathon night in 2015. This is the Friday night before the G-QRP Convention held in October every year. This kit is ideal for all construction levels of our hobby. The frequency of the supplied kit covers part of the 40m Amateur Band and some Broadcast Band. With a simple component change it can be made to cover other frequencies. -Kit Radio Company http://www.kitradio.co.uk/ KRC Offers mostly Shortwave receivers, but also has an 80 Meter direct conversion receiver, as well as some accessories. Prices are in British Pounds. Not sureabout shipping costs outside of the UK. KRC-1, 4-Band Superhet. Comes in 5 easy-to-build stages: 1) MW TRFreceiver driving an earphone, 2) Audio amplifier providing speaker output, 3)The TRF receiver is converted to an IF amplifier, 4) Mixer/oscillator converting the receiver to a 4 band superhet, 5) BFO to enable CW/SSB reception. Built on two circuit boards and comes with a pre-cut and labeled case. Runs on 6AA batteries (included). KRC-2, Regenerative SW Receiver. 1 – 30 MHz in 3 bands. Easy build. Very sensitive. Nice case and all accessories included. Runs on 6AAbatteries (included). KRC-4, Beginners TRF Receiver. 2 bands: 800 kHz to 1.6 MHz, and 4 to8 MHz. Uses a reflex circuit and only one transistor. Band selection is achieved with 2 plug in pre-wound coils. Will drive an earphone with only a few feet of wire as an antenna. Includes earphone, 3 AA batteries, and engraved front panel. KRC-5, 80 Meter Direct Conversion Receiver. Designed around the SA602and LM386 chips. Receives CW and SSB from 3.5 to 3.8 MHz. Includes earphone, 3AA batteries, and engraved front panel. -Kits and Parts dot com.http://www.kitsandparts.com/index.php K&P sells a line of accessory kits (filters, amps, etc) as well as parts for your own projects. They have a huge selection of ferrite toroids. 1Watter QRPp VCXO Transceiver. The 1Watter is a high quality inexpensive transceiver designed for the QRPp enthusiast Guaranteed 1 full Watt output on any band 160-10 Meters using 12 VDC. Designed for home and portable operation. Full QSK, dual conversion design with great selectivity. Very low noise measured at -137 dBm MDS. The VCXO covers both sides of the standard QRP CW calling frequencies. The PCB size is only 2.5" (63,5 mm) by 3.8" (96,5 mm). Includes keyer chip V4 with true "natural" sidetone. Available in multiple bands. The mcHF is a SDR Transceiver project that produces a full featured 160 thru 10 Meter radio. Includes color touch screen and all components to make the radio. Great project and supported by a large community of hams. -MFJ http://www.mfjenterprises.com/ MFJ has been a source for all things Ham Radio for years. They have a couple of kits in the catalog,plus they own Vectronics, also listed in this guide. MFJ-8100K World Band SWL Receiver Kit. Regenerative general coverage receiver covering 3.51 - 4.31 MHz, 5.95 - 7.40 MHz, 9.56 - 12.05 MHz, 13.21 -16.4 MHz, and 17.6-22 MHz. MFJ-93xxK QRP Cub Transceiver Kits. QRP Transceiver available in 80,40, 30, 20, 17, or 15. Output 2 Watts (except 1 Watt on 17 and 15). -Midnight Design Solutions. http://www.sdr-cube.com/ordering.html. These folks produce the SDR Cube transceiver. A neat standalone transceiver based on the Softrock. SDR Cube Quick Kit. Portable, standalone SDR transceiver for SSB, CW and AM using embedded digital signal processing with a Softrock as the RF front end for QRP operation. Live bandscope, high-performance T-R switching, multiple VFOs & memories, General Coverage Receive and bandswitching control are among the many advanced features.Expansion port supports external RF decks and accessories. Optimized interface for NUE-PSK modem provides digital mode support. Sold as pre-soldered boards and components to build the cube without soldering. -Midway Electronics. http://www.midwayelectronics.us/qrp/index.html. Midway picked up some of the Small Wonder Labs designs, and so far is producing an updated version of the SW-series CW transceivers. ME40+, 40 meter CW QRP Transceiver kit. This is an exact reincarnation of Dave Benson's Small Wonder Labs SW40+. Those of you that know the track record of his high quality rig can only appreciate its reappearance to the amateur radio field. Kit comes with full detailed manual, schematics, and interconnection drawings and all components needed to complete board. This unit has a sensitivity greater than .1 microvolts for copyable code and is adjustable up to 2.0 watts. This unit is designed to cover the 40 meter band (7.000 to 7.250 mhz), but is also available in 20 and 30 meter versions. A professional quality case with knobs and labeling is also available. -Mike's Electronic Parts. https://www.mikeselectronicparts.com/ Mike is the source for Fahnestock Clips! People are always saying how hard they are to find. In addition, he is the expert on TRF AM-radio-on-a-chip components (MK-484 and derivatives) and stocks other radio construction items like Litz wire and varicaps. He also has a couple of kits. The MK484 AM Radio Kit 7 is a simple AM broadcast band receiver kit designed for the MK484 radio IC. This kit is not a beginners kit. MK484 Radio Kit 7 does require soldering and the ability to read a schematic. The kit is designed to allow a modular radio build. The RF tuning section is left off board to accommodate a variety of coil and capacitor combinations. The audio output can be connected directly to a high impedance earphone or headphone. We have tested this kit with magnetic and piezoelectric headsets 2,000 Ohms and higher with good results. The audio output could also be fed directly to an audio amplifier. Available with several options and accessories. There are also several crystal radio kit options, including a nice solder-less one for beginners. -Mini Kits (AUS). http://www.minikits.com.au/ Lots of accessories in kit form from down under. Bandpass filters, amps, and much more. Their latest and most interesting product is the 630m Band 472 to 479kHz Transverter kit. -Multus SDR. https://www.multus-sdr.com/ Multus originally took over producing the Peaberry SDR, and expanded it into a multi-band 5 Watt transceiver for 160 thru 10 meters. Watch for other products! -Nightfire Electronics. http://vakits.com/catalog/ham-radio-kits. Nightfire carries an assortment of accessory kits and an updated version of the Pixie available for beginners and clubs. What I like about their offering here is that they have multiple 40 M crystals available, giving you a choice of operating frequency. Pixie Transceiver kit. This is the NightFire Electronics version of the very popular QRP Pixie CW Transceiver Kit. It is an upgraded version of the classic "PIXIE 4" low-power transceiver. The oscillator is crystal controlled with a little room for tweeking via a silicon diode being used as a psuedo varactor diode. This gives you some wiggle room. The transmitter will put out 360mWatts into a 50-Ohm load with a clean 12vdc input. The receiver works by using the output transistor as a mixer/detector and feeds the received signal into an LM386 Audio Amplifier. This will feed an 8 Ohm, 1watt speaker nicely. The Keyer is a switch to ground. The picture shows a simple push-button in its place, instead, it will come with a 2-pin screw terminal. 2-pin screw terminals are used for power input, Antenna output, Keyer input, and Audio Output. The PCB size is 2.5 inches x 2.5 inches. Double-sided, .062" with Plated-Thru-Holes. The bottom side is a good solid ground plane for RF noise reduction. -NoGa The North Georgia QRP Club. http://www.nogaqrp.org/ This club offers several ham accessory kits. For now I see a Wattmeter, a power indicator/guard, and a transmit/receive switch. -North Country Radio.http://www.northcountryradio.com/index.htm NCR is a source for many amateur related kits. Too much to list here, but they have several ATV related items. -Oak Hills Research. http://www.ohr.com/ Founded by DougDeMaw W1FB, the godfather of QRP. One transceiver kit, and several accessories. OHR 100A single band CW transceiver kit. Offered in 80, 40, 30, 20,and 15 Meter versions. Each can be aligned to cover 70-80Khz. 5 Watt output. -OZ QRP (Australia) http://www.ozqrp.com/index.html. Owned by Leon Williams (VK2DOB). Offers the MST (Minimalist Sideband Transceiver) as“short-form” kits (PCB plus specialized and hard to get parts).Ships worldwide. Prices in Australian Dollars. The MST (Minimalist Sideband Transceiver). Complete SSB transceiver on a single PCB (just add a VFO). Superhet receiver using a 4 pole 10MHzcrystal filter. 5W PEP minimum power. Front panel LED transmit power and modulation indicator. Simple and easy to build using all through hole components. DDS VFO available as an add-on kit. The MDT (Minimalist Double Sideband Transceiver) is an inexpensive and easy to build kit for the 40M band. It is ideal for the first time builder as all parts except the microphone socket are mounted on a single PCB and all the components are through hole. This is a full kit containing everything you need even the case and specially pre-cut and printed front and rear panels. -Peebles Originals http://www.peeblesoriginals.com/index.php Peebles sells a nice assortment of Crystal Radios, Regenerative Radios, and both Tube and Transistor Radios, in MW, and SW varieties. They also have a nice line of accessories for your homebrew projects including variable caps, tubes, semiconductors, and more. -QRPGuys http://qrpguys.com. QRPGuys are Ken LoCasale (WA4MNT), Doug Hendricks (KI6DS), John Stevens (K5JS), Steve Weber (KD1JV), Dan Tayloe (N7VE), Wim (SP5DDJ),Cliff Donley (K8TND). They have a nice assortment of radio kits as well as accessories including some antenna/tuner combinations that are worth looking at. Para80/40set Transceiver. Named to commemorate the “Paraset” clandestine vacuum tube transceiver that was parachuted behind enemy lines to Allied resistance groups in northern Europe, and Scandinavia during WW II. Steve’s new design incorporates a sensitive stable regenerative receiver covering ~270kHz, ~3 watt output @13.8V 80m or 40m crystal controlled CW transmitter like the original “Paraset”, but with modern solid state components that conforms to today’s spectral purity requirements, a “spot” switch, (3.560MHz and 3.5795MHz for 80m), or (7.030MHz for 40m) crystals. It is a standalone, thru hole, single board kit, that is powered by 12-13.8VDC, with a silkscreened PCB that can be used as is, or mounted in a chassis or case of your choosing. The board measures 4.00″ x 2.90″. All controls and components are board mounted, Main Tuning, Fine Tuning, Volume, and Regen. You will need to supply your own control knobs. Rear connections are female BNC antenna jack, standard 3.5mm jack for key, and a 5.5mm x 2.1mm 12VDC power jack. Earphone jack (3.5mm) is on the front. We show three possible homemade cases you can make. Sensitivity ~.5uV MDS. Current usage, TX ~460mA@13.8V, RX ~20mA. On a scale of 1 to 5, 5 being the most difficult, this is rated as a 3. Allow 3 to 4 hours to build. If you desire, the board has power and signal outputs for our digital dial, but it would need to ordered separately. Lidia 40m Receiver. The QRPGuys Lidia 40m Direct Conversion Receiver is the creation of SP5DDJ and he has dedicated it to the memory of his wife Lidia. Wim has granted permission for us to produce it as a kit. We are offering it on 40m, but the main IC is rated to 60mHz so it may be configured to work on other HF bands. The heart of the receiver is a 92 transistor Motorola MC3361C IC that includes an Oscillator, Mixer, and Active Filter. The kit features all through hole components, an integral open frame chassis, with rear BNC antenna connection, 3.5mm earphone jack and a standard 5.5mm x 2.1mm DC power jack. Our kit has the option of adding the QRPGuys thru hole Digital Dial kit to the front panel, which has the mounting holes and window cutout to fit. The layout has a front panel audio gain control, 10 turn pot. for main tuning, board mounted RF gain pot., and a switched adjustable audio filter for CW/SSB reception. Experimentation is always encouraged and we have incorporated solder pads to facilitate trying other filters and varactor combinations. The design allows mounting the main board in an alternate chassis if you desire. Chuck (K7QO) has measured the sensitivity at less than -120dBm or .2uV. We supply two varactor diodes that can be configured for 150kHz to over 300kHz bandspread. Current usage is ~44mA @12V with our digital dial. The LM386 audio amplifier has enough power to drive a small speaker if desired. Board dimensions are 3.50″w x 2.62″d x 1.75″h. (90mm x 66mm x 44mm) The unit weighs ~4oz. or (113g.). The thru hole digital dial must be ordered separately. On a scale of 1 to 5, 5 being the most difficult, this kit is rated at a 3. Allow about 3 hours to build. MMM+ 40m Transmitter. The QRPGuys version of the Michigan Mighty Mite, called the “MMM+” is for 40m. It uses a through hole, double sided PCB including all the needed components. Our design is also crystal controlled, has one toroid for the oscillator and two for the lowpass filter, with a built-in simple stainless steel transmitting key. We use the metal cased 2N2219A transistor with 300-400mW output depending on supply voltage, also a manual T/R switch which is fed to a 50 ohm dummy load on receive, to protect the transistor in case of accidental keying during receive. We have included a two position switch for the crystals, (7.030MHz included), 3.5mm jack on the front edge for an external key, 5.5mm x 2.1mm DC socket for the 12VDC input, and pcb mounted BNC connectors for connection to the receiver and antenna. All this is contained on a 2.60” sq. PCB, 1.8 oz., (51 grams). At 12V the current draw is about 100mA. Spurious outputs -50dB or better. It’s an excellent club or beginners project that uses most the basic kit building skills required for larger projects. On a difficulty scale of 1 to 5, 5 being the most difficult, this is rated at 2 or 3 depending on your experience. K8TND Regenerative Receiver. The QRPGuys K8TND Regenerative Receiver covers the 60, 49, 41, 31, 25 meter shortwave bands (approximately 4.5 to 12.7 MHz), with a receiver you build complete from the supplied chassis pieces, electrical components, and hardware. You connect the receiver to a simple wire antenna, that can be a simple wire in the attic, or one thrown up in a tree. Cliff Donley (K8TND) heavily modified a basic Kitchin design, with varactor tuning and toroid inductors. We incorporated Cliff’s design into a compact pcb chassis and with controls for Coarse Tuning, Fine Tuning, Regeneration control, and Volume. There is an attenuator that can be switched in at the antenna to prevent strong stations from overloading the input. The LM386 will drive inexpensive ear buds or a small speaker connected to the rear mounted 3.5mm audio jack. The chassis and component pcb are pre-cut and forms a sturdy assembly with the printed circuit board as an integral component of the completed unit. It is powered either by an on-board 9V battery or can use a 12V supply connected to the rear 2.1mm x 5.5mm pcb jack. All the electrical, chassis, and mechanical components are included in the kit with the exception of the battery, earbuds, and wire antenna. The receiver is 4.50″ wide x 3.00″ deep x 2.00″ high. On a difficulty scale of 1 to 5, 5 being the most difficult, this is rated at 2 to 3, depending on your experience. K8TND 40m Direct Conversion Receiver. 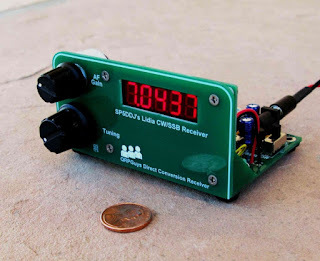 This is a sensitive direct conversion receiver kit that covers the 40m band for cw or ssb reception. It is a through hole kit that uses the popular NE602/612 mixer/oscillator and an LM384 audio amplifier for ear buds or a small speaker. Cliff has incorporated an LED for the AGC system. There is a switched attenuator on the front end to prevent overloading. All the controls and I/O are board mounted. Front controls are Coarse Tuning, Fine Tuning, and Audio Gain. Rear connections are 12V power jack, 3.5mm audio jack, and the BNC antenna connection. The Power and Attenuator switches are board mounted, with pads for 9V battery operation if desired. We have provided power and signal pads for our Digital Dial if you want to add that option. All the receiver components are included in the kit with the pcb. It is a little over 2.50” square, and the same size as the MMM+ transmitter. Current usage is ~10mA. -QRPme. http://www.qrpme.com/ Several kits and accessories here. They also have an intriguing kit of the month club” delivering kits to you every month. The Topper II P.A. just added band packs, making it an attractive little QRP amp. QRPme is the new home of the official RockMite. RockMite. This is QRPme's re-vamped version of Small Wonder Lab's RockMite kit. The kit has been updated so that it is now all thru-hole construction. The previous version required some SMT work. 0.5 Watts at 13Volts. Automatic reversible offset, sidetone, built in keyer, fits in a standard Altoids tin. Available in an assortment of frequencies for 20, 30, 40,and 80 meters. Micro 80D. Small tunable 80 meter CW transceiver kit. Lil Squall Transceiver. A version of the Pixie Transceiver. A tinkerers delight. It fits in a small tuna can. Includes a socket for the Final transistor for easy experimenting with output power. Likewise, the feedback caps in the oscillator circuit also have sockets making it easy to experiment with new bands. The crystal also has a socket for easily moving the operating frequency about a band. Comes will ALL the parts necessary to complete the transceiver and a 7122 crystal for operating the Lil' Squall ][ in an area where other minimalist rigs hang out, AND the 'officially unofficial' TUNA Net frequency for tuna can gatherings. Super Tuna II+. A version of the Sudden Transmitter from the GQRP Club. Transmitter section is comprised of an oscillator, buffer and final driver transistor. Produces 2 watts at 12.6 volts. Frequency dependent components are mounted on an easily changed band module. The basic kit comes with a band module for 40 meter operation. Tuna Tin 2 35th Anniversary Isuue. A re-issue of the original TT2transmitter. Parts are laid out on the board in the exact same way the schematic is drawn. Simple, and easy to build. Comes with crystal for 7.030. Sudden Storm Receiver Kit. Great companion to any of the tuna can transmitters. Comes with components for 40 meters but can be operated on 80,30, and 20 using the upgrade kit. Reggie II Transceiver Kit. A lesson in minimalist design. The Reggie uses the Limerick construction technique. Output is about 100mW. BitX20A/17A SSB Transceiver. The BitX20A and BitX17A are complete SSB kits with board, all parts, digital display and custom powder coated and punched case that is based on the BitX20 that was designed by Ashhar Farhan. Output is about 10 Watts. PFR-3a 3-Band Portable Field Radio. Bands : 40 meters, 30 meters and 20 meters. Tuning range: Full band coverage. Mode: CW only. NADC30/40 CW Transceiver. Nearly All Discrete Component CW Transceiver for either 30m or 40m. Tuning range ~ 60 kHz. Power output: 3.5 watts. Ft Tuthill 15 Meter CW Transceiver. Two 60 KHz tuning ranges, ~ 21.000 - 21.060 and 21.075 - 21.135 MHz. Power Output: 5 Watts. Ft Tuthill 160 Meter CW Transceiver. Two 30 KHz tuning ranges, ~ 1800 - 1835 and 1830 - 1865 MHz. Power Output: 5 Watts. DCxxB Board Only Trasceiver Kit. These radios are the next generation of the popular DC40 transceiver that was also designed by Steve Weber. The kit will come with 1 crystal for the band specified. 7.040 for DC40, 10.120 forDC30, 14.060 for DC20. Weber Tri-Bander. The Weber Tri-Bander can be built for any three of these bands: 80, 40, 30, 20, 17, or 15. 5 Watts out on all bands at 13.8 VDC.Built in Iambic keyer with 5 to 40 wpm code speed. DDS VFO for rock steady stability with 50 Hz and 200 Hz tuning rates. Many more features! Scout Regen Receiver. A simple 2 band regenerative radio receiver that is capable of receiving signals from 3.5 to 11 MHz. A complete kit with Lshaped aluminum chassis, quality double sided silkscreened solder masked board,all parts, hookup wire, board mounted battery holder. This kit is ideal for thefirst time builder. SMK-2 40m Surface Mount CW Transceiver. The SMK-2 is a fully functional surface mount component 40 meter transceiver. It has an independently tuned transmitter and direct conversion receiver. Full break-in TX with sidetone, and a modest 350mW output. The crystal VXO on receiver allow about 3 kHz+ tuning range on the crystal frequency. It was originally conceived as the SMK-1, a platform to teach SMT construction techniques. TwoFer Plus CW Transmitter. The TwoFer Plus is a simple transmitter that will be offered on 40, 30, and 20 meters. The kits come with crystals in the qrp region of the band. It will put out approximately 1 Watt using a 2N3053transistor for the final. It has a crystal based VXO that will give about1.5kHz on 40, and 3kHz on 20. It also has a built in T-R switch on the board that mutes the receiver during transmit. We have upgraded the kit with a custom prepunched case that was designed by Ken LoCasale, WA4MNT. The kit comes complete, with all parts, connectors, case, knobs, wire, and our usual commercial quality double sided, plated through, silkscreened solder masked board. KD1JV Survivor 75m SSB transceiver. There is a long story about the history of this kit on the website. This is a re-design of the Epiphyte transceiver from Norcal. 10 Watts output, SSB, CW, and TUNE modes, Covers a user selectable portion of 75 Meters, either 325 or 175 kHz wide, selectable atbuild time. All through-hole construction. Requires 13.8 volts @ 2 Amps min. Simple Receiver. A new design from Dan Tayloe, which can be built foreither 30 or 40 Meters. VFO controlled and superhet. 40M coverage is 7.000 -7.022, and 7.024 - 7.049. 30M coverage is 10.100 - 10.120. Headphone level output, 3 pole crystal filter, AGC, and much more. Simple Transmitter. Also from Dan Tayloe. Designed to replace the Twofer eventually. Initially sold for 10 Meters only, since the Twofer had issue with 10 Meters. 4 Watts out at 12V. Spot switch, built in keyer, receiverT/R switch with "mute" output. -R3KBO (Russian). http://eb104.ru/ This Russian Ham Radio site needs to be run through Google Translate, but they sell a nice variety of amplifier, filter, and tuner kits. -Radi0shop (eBay store). http://stores.ebay.com/radi0shop This eBay store is selling a couple versions of the Pixie II transceiver. They currently have 80 meter, and 40 meter versions. Looks like a very simple build.$39.00 free shipping. -Rainbow Kits. http://www.rainbowkits.com/index.html Rainbow has a large selection of kits for the tinkerer, and several accessories. -Small Wonder Labs. http://www.smallwonderlabs.com/ SmallWonder Labs, home of the RockMite transceiver for so many years, has closed for business. QRPME.com, the tuna can people will be taking over official production of the famous RockMite. They are listed elsewhere in this guide. -SOTABEAMS http://www.sotabeams.co.uk/ Sotabeams sells a ton of accessories and antennas for QRP use. Pretty much anything you can imagine. Many of the items are in kit form. This page is a GREAT resource for the do-it-yourself Ham. -Steven Weber. http://kd1jv.qrpradio.com/ Steven, KD1JV is known for many great kit designs over the years, and while he does not sell kits directly at this link, you can find information on his Yahoo Group where he sometimes offers up new projects. Also, on this web page you will find links to many of his designs with schematics, and many with circuit boards available through FAR Circuits. Steve designed the radios now known as the Mountain Toppers which are available fully assembled from LNR Precision. -TAPR. http://www.tapr.org. TAPR is a community that provides leadership and resources to radio amateurs for the purpose of advancing the radio art. They offer a couple of accessory kits, and the very popular WSPR Pi Module, as well as the modules needed to build a HPSDR system. WSPR Pi Module. available as a kit (for 30 meters), or a pre assembled board (for 20 or 30 Meters) that can be used with a Raspberry Pi to create a WSPR transmitter. The GPIO pins on the Pi are capable of outputting an RF signal, but it needs to be filtered and amplified. The WSPR Pi module does just that. It filters out the harmonics and spurs and has a buffer amp that boosts the signal slightly. Once you install and configure the software, you'll be on the air as a WSPR transmitter. Modifications can be made to use the board as a transmitter for other modes, and can be used in combination with an SDR receiver to create a transceiver out of a Raspberry Pi. -Tony Parks, KB9YIG. http://fivedash.com/ Tony has closed shop. After producing the line of SoftRock kits for years, he has decided to retire from the business. We wish him well! -Unified Microsystems. http://www.unifiedmicro.com/ UnifiedMicro sells a nice line of accessories including a couple of kits. Of special note is the SCI-6 sound card interface kit, for operating in digital modes. -Vectronics (MFJ)http://www.vectronics.com/Categories.php?sec=209. Vectronics has a large selection of Ham Radio kits and accessories. Some of their products are similar, or even identical to their parent company's products (MFJ). Shortwave Receiver Kit (Regen). Covers 75/80, 49, 40, 30, 31, 20, 25,22, 19, 17, 16, 15 and 13 Meter bands. Explore AM, SSB, CW, WWV, and digital signals. Vernier reduction drive, smooth regeneration control, RF stage.Includes all metal cabinet. 2 earphone jacks. Uses 9V battery. The Rockwell. A simple Regenerative Tuned Radio Frequency (Regen TRF) receiver design for those just embarking on electronic construction projects; it is also suitable for Radio Club group building projects and You should be able to build it in a couple of evenings! It has two general coverage bands which can be chosen from MW or around 160m, and around 80m or 40m. These are chosen by alternative fittings for the four ready wound inductors. Because it is a Regen TRF it is ideal for the powerful broadcast stations of the Medium Wave (and the 'short' wave) bands, using Amplitude Modulation, which can be easily heard with a short aerial; so start by building it for the MW as a good confidence booster! Because it is a Regen TRF it can also copy the common modes of Morse, and phone Single Sideband used by amateur radio enthusiasts. It has three controls - the Main tuning, and RF gain control and the Regen control. It uses four transistors arranged as an RF amp, the regen stage and two for the audio amplifier. The audio amplifier is designed specifically for modern 32R stereo phones which turn the RX on when plugged in and there is also very smooth control of the critical point of oscillation. The kit includes 5m of aerial wire for an initial 'throw-out' aerial which is usually enough for MW reception. The Isle CW TX. This is a 1.5W single band CW transmitter, that uses a crystal or, depending on band, a ceramic resonator for frequency control. The band can be any one of those in the 20 - 80m group. The kit includes a 3.58 MHz ceramic resonator for 80m which can be pulled over several tens of KHz down from the nominal figure using the on board trimmer. For the higher bands you have to use a crystal which means that the trimmer will then only have a very limited tuning range. The single band version is shown below with a single crystal, however there is space for three 'crystals' which can all be in the same band if you wish, so that the single harmonic filter on the Isle PCB will serve for all three frequencies. If the extra crystals are in more than the single band, you need extra low pass filters - using the Dual LPF kit. TR control of the aerial relay (it has to be mounted elsewhere due to lack of PCB space) is semi-break in from the key and includes facilities for muting the RX. If wanted, the TX can be driven by an external frequency source such as either mixer kit instead of using 'crystal' control. The Axe. This is the transmitter for those wanting to get on the air quickly with DSB phone! It is entirely compatible with other stations operating single sideband! It produces a peak output of 1.5W when used on a nominal 12v supply. It is normally for any single band in the 20 to 80m group. Frequency control is by the included ceramic resonator for 80m giving about 50 KHz coverage down from 3.69 KHz with the on-board trimmer; for the higher bands where ceramic resonators are impractical, you will have to use a crystal with a tuning range of just a few KHz - the prototype (with crystal) shown below is for 20m. Ceramic resonator or crystal control would be appropriate for a simple RX where its VFO is at reception frequency, but the Axe can alternatively be driven by an external LO signal derived from a mixer kit! This avoids the limitations of 'crystal' control! A SA602 is used for the balanced modulator which then drives an AD8055 high speed op-amp. Because the gain through these stages vary with band, the single drive level preset has to be set for that band which means that the rig is limited to single band operation. The output stage has three BS170 MOSFETs operating in parallel - these are ideal for the LF bands where a standing bias current is needed linear operation! The standard Axe can also be used to drive an external liner amplifier. The output stage is followed by low pass harmonic filters and the control circuits include RX muting and control for the TR relay which has to be mounted elsewhere due to lack of PCB space. The Ford. This is a single band Direct Conversion Receiver that has been designed for builders wanting their first serious amateur band receiver. Normally I would suggest that it is built for the 40m band as this often has stations that are national as well as much longer distances when the propagation conditions are good. It is laid out with plenty of space around all parts and can run from a 9 volt PP3 battery or from an external nominal 12 volt supply. Much thought has been given to making it easy to build; there is a very detailed Project Construction Manual kindly compiled by Steve G0FUW who has run many Buildathons in recent years. The Manual can be downloaded here! (You may need to minimise this website in order to open the pdf file.) The actual kits are supplied with other important information such as the circuit, parts list, and the options for 20 or 80m bands. The PCB is 100 x 160 mm and only has tracks on the underside. The design has an RF gain control followed by a double tuned RF bandpass filter which feeds the product detector or mixer. The other input of this mixer (twin JFETs) is driven by the Local Oscillator that runs at band frequency and has both a Main tuning control (with the large knob) and a Fine tuning control to make it easy to resolve stations. Being a direct conversion RX allows it to receive Morse or normal phone SSB or even DSB! An Audio Frequency Gain control follows the mixer and feeds a two stage audio amplifier that is designed for modern lightweight 32R stereo phones. The provision of both RF and AF gain controls makes it much easier to deal with BCI which often plagues simple designs! Also because it has an RF amplifier stage, there is far less LO radiation which much reduces unwanted hum effects that are often problematical with DC designs! The Culm. This is a new CW TCVR for any single band 20 to 80m. On 80m it uses a ceramic resonator for the VFO giving several 10s KHz tuning range. The RX is direct conversion with a PolyVaricon for the main tuning and a voltage controlled diode for the Fine tuning beat note offset, which is automatically cancelled when you go to transmit. The RX has an RF amp with an RFG preset, followed by a double tuned RF filter and then a pair of JFETs for the product detector. This is followed by the first audio amp and a humped low pass CW filter centred on 725 Hz , which feeds the AFG pot and the audio power amp for a LS or phones. For transmission, the VFO feeds digital gates for the RF keying which then drive a buffer stage and a pair of BS170 MOSFETs in the output stage for a nominal 1.5W (with a 13.8v supply) on any band to 20m. The transmitter output has twin pi low pass filtering and the TR control circuits automatically disconnect the LPF from the RX RF amp when transmitting for click, and thump-free full break in changeover! There is also a 725 Hz sidetone oscillator, with adjustable level, that feeds into the RX audio amp. The 3.58 MHz ceramic resonator can be replaced by a crystal of your chosen frequency for the higher bands where ceramic resonators are not suitable, or by a 4 MHz resonator that can drive the Sim-mix kit fitted with a crystal to for any band output (including 5262 KHz!) up to 20m - this has the advantage of giving approx 50 KHz tuning range instead of the very limited range with a crystal. The Sparrow. This is a new crystal controlled transmitter that was originally designed for demonstrations of simple AM receivers in modern buildings, where reinforced concrete forms a Faraday cage preventing reception of external signals. But it can also be used as a normal transmitter with large external aerials working with Spaxton, Rockwell and maybe Ford RXs. It provides RF signals for speech using Amplitude Modulation; or Morse either by injecting a keyed 725 Hz audio tone into the AM speech amplifier for MCW, or ordinary plain interrupted carrier CW. The peak output power is nominally 1.5W on 13.8v supplies so the corresponding AM carrier power is 0.35W. The standard kit is for 160m using an 1843 KHz crystal with an IRF510 in the RF output stage; other bands are possible - please ask me about them. The switch changes between the MCW and ordinary CW modes. The sidetone oscillator is activated for either type of Morse, with an optional audio output for feeding into an external amplifier, even when the RF parts are switched off for simple Morse audio demonstrations. The design includes a TR antenna relay and adjustable level muting for receivers where it is desirable to be able to hear a beat note from your own transmitter. It has socket inputs for a dynamic mic, with PTT switch, and a straight key. The RF output filter assumes a 50R load - real or dummy! Halse and Hatch. The emphasis in this phone singe sideband design is ease of construction. The Halse RX can be used on its own but together they form a single band 5 Watt SSB TCVR for any single band of 20, 40 or 80m. The superhet's IF is 9 MHz which gives coverage of the 20 and 80m bands with a single VFO band near 5 MHz; and by just changing the VFO inductor it can work near 2 MHz for the alternative 40m band. Starting at the aerial, the receiver has a double tuned RF filter, followed by the first mixer which is an SA602 having its own discrete IF amp prior to the IF filter which uses four crystals in a ladder formation. The second mixer is also an SA602 which includes the Carrier Insertion Oscillator and can work on either sideband by the addition of an inductor. The first audio stage uses a pair of BS170 MOSFETs driving the AF gain control, which is followed by the audio output stage able to drive a loud speaker or phones. The RX PCB is nearest the front panel in the photo below. You can add the Mini CW kit, the Mini AGC, and or a digital frequency readout - the three digit one is most appropriate. -WB6DHW.com http://wb6dhw.com/For_Sale.html WB6DHW carries the UHFSDR board and kit, plus several add ons and accessories. UHFSDR Transceiver. The UHFSDR is a Software DefinedTransceiver covering the 1.75 MHz to 700 MHz frequency range. A Si570 is used for frequency control. Two LVPECL 4 GHz max.flip flops produce I and Q LO signals at 1/2 the Si570 frequency. A pair of 1-1000MHz Double Balanced Mixersare used to convert signals to and from base band. A receiver pre-amp (2dBnoise figure) and a transmit pre-amp(50mW max output) are provided as well as antenna switching plus provision for separate receive and transmit connections. There is a Yahoo Group for support. Excellent post Neil. It's nice to see folks doing the work of gathering specialized information and posting it to help others.